One early project in the 1990s focused on the remote Darién region of Panama. Official maps of the area contained little detail—the persistent cloud cover and dense rainforest canopy were impenetrable to the satellite imagery and aerial photos that government cartographers used to make their maps. But to the three main indigenous groups in the region, Emberá, the Wounaan, and the Guna, the land was filled with landmarks. 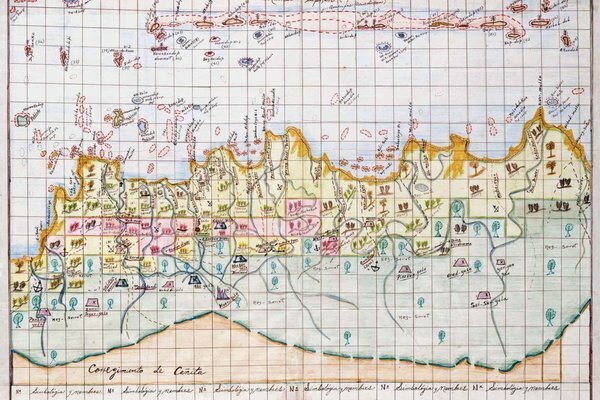 The organization’s approach was simple: ask indigenous people to draw detailed maps of their lands, and then get professional cartographers to incorporate this information into modern, geographically accurate maps. To map the Darién, indigenous leaders selected men from communities in the region to act as surveyors. The surveyors then set out by bus, by canoe, or on foot, armed with pencils, pens, and blank sheets of manila paper to sketch the local waterways and other landmarks. In collaboration with villagers and their leaders they carefully drew maps that included things of importance to their communities that wouldn’t typically appear on government maps, like hunting and fishing grounds, or places where firewood, fruit, or medicine were gathered. They often chose to leave out cemeteries and sacred sites, preferring to keep that knowledge within their communities. The quality of these maps varies considerably, but the best of them are works of art, Chapin says (see below). Accessoirement, des villages entiers n’apparaissent toujours pas sur GG maps en Malaisie, dont Kampung Peta où je devrais passer un ou deux mois comme anthropologue débutante. Kampung Peta = Village Carte, ah ah !